Perforation will allow you to easily tear off part of the ticket. This could be useful for products such as concert tickets, movie tickets, coupons, and similar products where it makes sense to keep part of the ticket while tearing the other part off. The final product will be separated into two sections by a single line of perforation. Numbering will make your event tickets identifiable by sequential numbers. If you select "Perforation & Numbering", Numbering will apply to both sides of the Perforation line at the position you designate (Top, Center, or Bottom). If you do not select "Perforation", Numbering will apply only once. Numbering cannot be printed on UV coating. Also read information on "Numbering Position" and "Numbering Color" on the product page. If you select Perforation and Numbering, Numbering will apply to both sides of the Perforation line at the position you designate (Top, Center, Bottom). If you do not select Perforation, Numbering will apply to the area designated by the arrows only. With custom ticket printing, you can present your upcoming event in the best light possible. When people are presented with professional-looking tickets, they are more likely to attend an event - that's why it pays to invest in quality concert tickets printing services. Printing event tickets is an important part of throwing a first-rate gala, concert or other event. Our topnotch concert tickets printing services will put stylish, professional event tickets in your hands for a very reasonable price. The tickets that you present people with are the first impression that they'll get about your upcoming event. When printing event tickets, it pays to invest in quality. 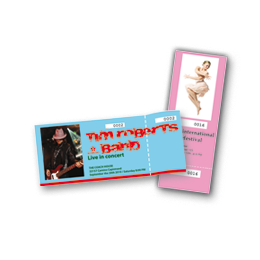 Our custom ticket printing services are reliable and exceptional. Why pay for concert tickets printing that doesn't make a great impression? Our concert tickets printing services are the most convenient and affordable way to obtain topnotch event tickets. Don't trust your custom ticket printing to just anyone. We're the experts in printing event tickets!